While the Obama administration gets fairly high marks in most domestic quarters for it's response to date regarding the serious crisis in Egypt, the skeletal remains of American credibility throughout the rest of the world have taken yet another body blow with the news that at least some of the 1.3 billion dollars in military aid to Egypt's regime has gone towards the development of WMD's. It seems that, under Mubarak, Egypt has had an active and ongoing program to develop chemical, biological and even nuclear warfare technology, ranging from a three-way deal with N. Korea and Pakistan involving medium range missiles to a covert facility in Argentina for experimental uranium enrichment. Of particular embarrassment to the U.S. is that while Mubarak supported the overthrow of Sadaam Hussein, it was he who supplied the sarin gas to the latter to be used on the Kurds. Sarin gas that was developed with American funds. And obviously this all occurred with the full knowledge and at least tacit consent of the American government. Not that any of this is necessarily breaking news. For most of the last 30 years this information has been there for the asking. It's just that mainstream American media have not had cause to report it, at least not until now. I'm wondering why? One plausible guess could be that the U.S. government would have had too tough of a time explaining that we were invading Iraq because of WMD, when in fact we were supporting the same sort of behavior in Egypt. However onerous this news may be, the injection of WMD's into the Egyptian equation sets up a late in the game opportunity for American fear-mongers. The purveyors of fear were in the game from the very beginning. From the first hours of the Egyptian uprising there began whispers of the "Muslim Brotherhood". Over the last weeks those whispers have become loud voices, portraying them in the most exaggerated terms not only in numbers but as to their purpose. Despite the mutual disdain and hatred between the two groups, the usual reference to al-Qaida creeps into the narrative. The right-wing media jockeys are already pointing to a conspiracy of radical Islam with the American left to overthrow Mubarak, with one even suggesting the inane claim that the Egyptian revolution has as it's aim a new "caliphate" to spread Sharia law across the entire globe. It is beginning to become troublesomely clear that the U.S., along with others of our allies, like Israel, are embracing the Suleiman solution, whereby the newly appointed Egyptian Vice-President would preside over a transition government. The so far leaderless populist revolt has already voiced its adamant rejection of this scenario. Omar Suleiman, a decades long supporter of Hosni Mubarak, is a firm entrenchment of the old regime, correctly viewed by the people as a torturer and a "yes" man. 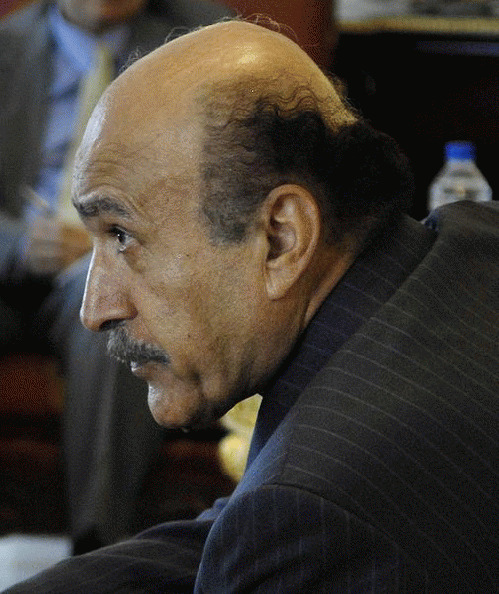 He is a retired army general and former intelligence chief who as director of the Egyptian General Intelligence Service (EGIS) entered an agreement with the U.S. in 1995 that allowed for suspected militants to be secretly transferred to Egypt for questioning. He was reportedly required to provide assurance that prisoners brought to Egypt would not be subjected to torture, but at least one CIA officer testified that such assurances from Suleiman were worthless as "a bucket of warm spit". While Suleiman's official duties at EGIS regarded foreign and military intelligence it requires a contorted imagination to believe that he did not also use his power to spy on and intimidate unsuspecting Egyptians. In my view Omar Suleiman has the appearance of a common thug wearing a coat and tie. All of this aside, the question still presents itself as to the legitimacy of any high ranking military official having the necessary motivation to oversee an honest and fair transition of power. Albeit the Egyptian army at it's lower level of conscripts appears to be supportive of the people, it is difficult to believe that the higher level of generals and ministers are not at first interested in maintaining as much of the corrupt status quo as possible. Along with their wealthy business-class counterparts, the military elite are not likely to let go of power or the purse easily. Do the majority of Egyptian people wish to see this group overseeing a revision of their constitution or setting the rules of engagement for new elections? I think not. What we are witnessing has become all too familiar. On the one hand our government extends the hand of America by extolling the virtues of democracy, offering aid to the innocent, decrying injustice, supporting the cause of the people, and assuring all that the future of their nation is to be determined by them and only them. Leaders and politicians give grand speeches and make emotional statements of support. It all looks wonderful on the evening news. This is what Americans really believe. It is what we want to believe. We embrace these principles. It is at our core and serves as the cornerstone of what we see as the goodness of America. But behind the scenes something very different is taking root. Fear is setting in. Those in the know are increasingly concerned about our past complicity with the guilty party. Every effort is being made to place the proper spin on past and current events. We are starting to hear the phrase "peaceful, orderly transition", a translation of which could be "how do we effect the best possible outcome for America?". The prospect of a functioning, truly democratic nation that is not fully on our team is too much to swallow for some in our government. Spoiled by the relative ease of dealing with a well entrenched dictator, they just are not ready. Nor or they ready to accept any responsibility or blame for the three decades of policy in which they were complicit in the demise of the Egyptian people. In spite of all it's pronouncements of support for a transparent hands-off approach to the formation of a new government, the U.S. is actively promoting it's own agenda. Enter the Suleiman solution, with all the shallow promises, vague gestures and back room deals that are sure to accompany it. But in this self-serving attempt lies a real dilemma. How do our policymakers sell this idea of an already rejected caretaker government to an overwhelming majority of altruistic Americans who support the populist cause of the Egyptian people? Actually it is a relatively simple task. It has been done before. In one word.... "Fear". It is the brand of fear that transcends all idealistic notions of democratic freedom and trumps our deepest desires for affinity with the Egyptians camping in Liberation Square. It is the same imagery that closed the deal with us on Iraq. It requires only the mention of two phrases: "Takeover by Radical Islam" and "Weapons of mass destruction". With these two elements added to the mix, a justification for U.S. influence in the shaping of any transitional government in Egypt becomes not only a possibility but a likelihood. So now we have it. A fresh revolution in the Middle East. A popular, secular uprising of an honorable and proud ancient society who have had enough of pharaohs, dictators and military regimes. And unlike our episode in Iraq, it is a totally self-generated movement with no outside forces, no ideas of "occupation" by a foreign military, and no U.N. resolutions. For once it would be nice to end up on the right side of history. In light of our recent questionable affiliations with dictators and illicit regimes it would be a huge step in the right direction if we were to place our principles above our fears and just do what is right. Certainly diplomacy will be much more difficult with a properly represented democratic nation that has such diverse political viewpoints, and there are some legitimate concerns about Egypt's future relationships with it's neighbors that can't be ignored. But we should not blow these things out of proportion. The new Egypt will disagree with us on many issues, of that we can be quite sure. Our own is a nation of political diversity with radical elements of all flavors having a voice. For what reason do we find such great difficulty in granting that same latitude to our Egyptian counterparts? In spite of the potential conflicts there most assuredly would be enormous opportunities for us to find common ground, and I believe that any compact between our nations would be a real milestone towards a peaceful and prosperous middle east. We should remember that we had our own revolution. The American collection of colonies had it's own transitional government and had no singular leader. Our new nation required over a decade to write it's constitution and elect it's first president. During our transitional period there was a myriad of viewpoints to be dealt with, from those who wanted appeasement with England to others who did not wish there to be a "united" states at all. We were a Christian population of different denominations who had some serious conflicts with each other, yet we settled on a secular government. Accounts by it's own members portray our Continental Congress as being a difficult and sometimes ugly affair. The rest of the civilized world didn't quite know how to deal with us and were concerned as to our intentions. Other colonial powers worried that our revolution would spread across the globe. But we avoided any foreign intervention or influence. What we ended up with was truly of our own making. We owe the Egyptian people that same opportunity. Wisconsin Union Busting: Convoluted Economics? Egypt, Tunisia: Answers? A Warning? Punditry & Politics Won't Solve the Oil "Curse"